So you've tightened up unwanted/unplanned ventilation, such as leaky windows and doors. You've dealt with cold draughts and bigger issues to avoid heat loss and to save energy. You may find that you now have more problems with condensation than before. That can lead to mould, and damage to your building. It can also cause health problems for occupants of the house too. Some simple actions and some tech can help. We found that condensation on the bedroom windows in particular was getting bad. We had to wipe down the windows two or three times per week with a towel to remove the water, and wipe away spots of mould. In the very cold weather of the 2009/2010 winter (several degrees below freezing) we have all been sleeping with our windows shut. So to improve general ventilation all round during the day we make sure that the bedroom radiators are off and doors shut and the windows open for somewhere up to around an hour. We force a change of air in the room without cooling the rest of the house too much. Another important means to avoid condensation is to keep your kitchen door closed when cooking (and maybe keep a window open). Likewise the bathroom door while bathing or showering. Then open the bathroom windows afterwards, with the door still shut. This avoids the bulk of the moisture from these "wet rooms" getting into the rest of the house. Instead it is vented to the outside, while not cooling the rest of the house. We avoid using the tumble dryer if we possibly can. (Maybe once or twice November to February when outdoor drying is impossible.) So we bought a washing machine with the fastest spin we could, leaving little residual dampness in the clothes after the wash. We then dry the clothes in the kitchen on a clothes horse (with a few stubborn things on the radiator too). But as we keep the temperature up a bit ("1" rather than frost TRV setting) and the kitchen has direct external ventilation because of the gas cooker, this does not seem to cause a dampness problem itself. The kitchen window is rarely significantly misted up or worse. As a test 2010/12/24 I bought the Argos 425/0777 (MDT-10DMN3) portable dehumidifier. It is speced to extract 10l of water per 24h. It is rated at 220W consumption but actually measured at 183W. For our smallest bedroom it reduced the relative humidity from about 73% to 50% in a couple of hours and the air felt distinctly drier. The aim in the first instance is to reduce or remove visible condensation on windows (and any out of sight elsewhere). It also should act as a small heat pump with a CoP (coefficient of performance) of better than 1 by extracting heat from the moisture that was in the air. 2012/01/13: our MHRV was having trouble preventing condensation on windows upstairs when it was cold (below 5°C) outside. (Possibly because of laundry drying and cooking in the kitchen.) I set the dehumidifier up in the kitchen late morning. Nine hours later the kitchen was warm (~20°C), humidity was low (~57%RH), even after some more cooking, and the laundry was reasonably dry. The dehumidifier had removed ~1.5l of water from the air. Running ~9h at 180W (as previously measured), ie ~1.7kWh, is a big chunk of our usual ~4kWh/d energy budget. Still probably less than tumble drying. It also provided heat, and removed other kitchen/house humidity. Removing 1l of water from the air with that device uses ~1kWh. It takes about 6h. It has a heating CoP of maybe 1.6. Re internal condensation, have you tried simply getting the air moving more locally e.g. a fan, in those rooms far from the MVHR. So not venting the energy filled air air out, but just moving it about. Getting the RH down would of course be best, by dehumidifying and/or lifestyle changes, but in my old house static air, e.g. in the "furniture shadows" was the real contributor to where condensation appeared. Be careful that you don't just hide other ventilation problems when using a dehumdifier. If you have a gas fire or gas oven it will put humidity into the air along with combustion products such as CO2. High levels of CO2 which may make you tired or give you a headache. Even without a combustion device you put out about 1kg of CO2 each day breathing. You need to let it out and let oxygen in one way or another! In severe cases with gas fires and ovens, poor ventilation may result in a build up of CO (Carbon Monoxide) not just CO2. Carbon monoxide can be deadly. Yes, you want to conserve heat. But "make it tight, ventilate right" needs the ventilation part too. 2018/08/13: Breaking the mould in Thamesmead. 2018/02/26: Breaking the Mould: Should landlords be doing more? : "The first phase of the study has now been completed, and showed clear links between the severity of mould and incidence of respiratory conditions. Some species of mould can be highly toxic, and disturbing while cleaning can sometimes be hazardous. The study also revealed that mould is most likely to occur in homes with higher occupant density, and in homes that are less well insulated. ..." and "Residents do not always link the importance of ventilation with their experience of condensation and mould. They are often much more concerned with keeping the heat in, than with a regular ventilation regime. Clear advice from landlords on good ventilation practice could help residents manage condensation and mould issues. ..."
2017/10/31: Child who got acute bronchitis from damp home awarded EUR20k: Judgement places responsibility for managing ventilation and condensation in rental homes with landlord not occupant h/t @Beyondpassive. 2017/07/01: NEA: Video: avoid damp and condensation (with BSL signing): Think HIVE: Heating, Insulation, Ventilation, Excess Moisture. Suggests keeping rooms at minimum of 15°C to avoid condensation on exterior walls, amongst other advice. 2014/07/02: NEA: (video) Avoiding damp and condensation. 2013/05/14: Is interstitial condensation a risk? 2012/11/28: Three ways to avoid condensation around your windows in Fairbanks Alaska! Note that there in a very cold climate it is a good idea to keep relative humidity (RH%) between 30 and 50. 2011/11/30: What is Humidity and How Does it Effect Home Energy Savings? 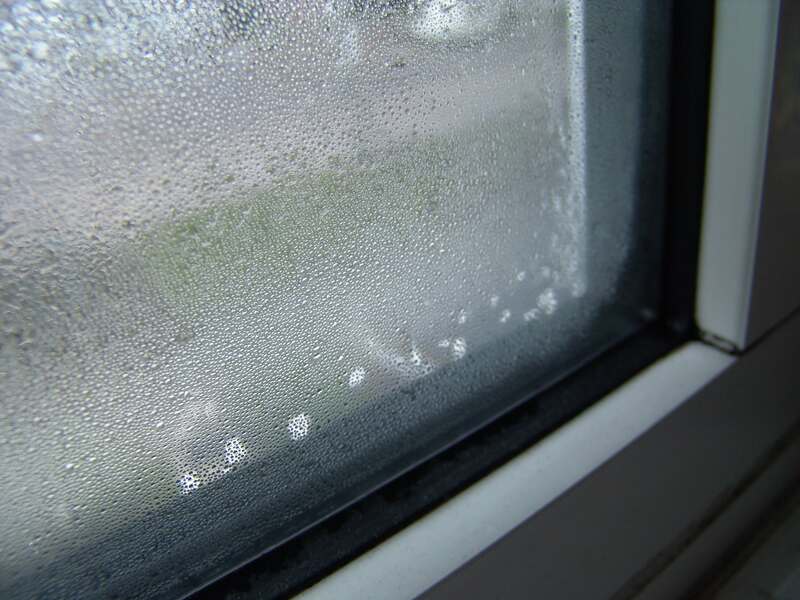 2011/10/24: Why Is Fall a Good Time of Year for Window Condensation? English Housing Survey Energy Report, 2014: "4.1. Condensation occurs when moisture that is held in the air (water vapour) comes into contact with cold surfaces and condenses into water droplets. Over time, the area can become damp. Mould can grow when relative humidity is above 80%. ..."
Ways to reduce condensation in the home: a list on the Green Building Forum. DIY Data: Condensation around the house. First published 2010-02-28 , updated 2019-04-22 . Site copyright © 2007-2019 Damon Hart-Davis. Hosted by ExNet.